Click here to view standard yoke & bolt manway dimensions and ratings. Clamp bolt manways are a low profile alternative to the yoke & bolt manway as well as a reasonably priced unit for vacuum applications. 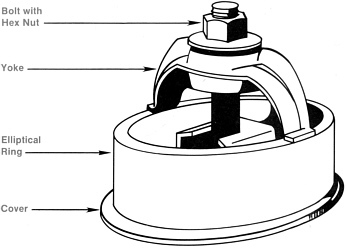 The standard assembly consists of a ring, pressed cover, clamps with bolts, and a gasket. Rings and covers are available in carbon steel or stainless steel.Click here to view standard clamp bolt manway dimensions and ratings..
Click here for required elliptical ring depths for different sized vessels and manways. Hinged closures are designed for use where you require frequent access to pressure vessels and lines. They’re easy to install and require very little maintenance/ Replacement parts are readily available. 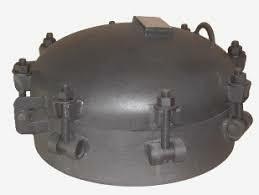 Hinged closures are manufactured to meet the requirements ofd the ASME code for boiler and pressure vessel, Section I and Section VIII, Division I. 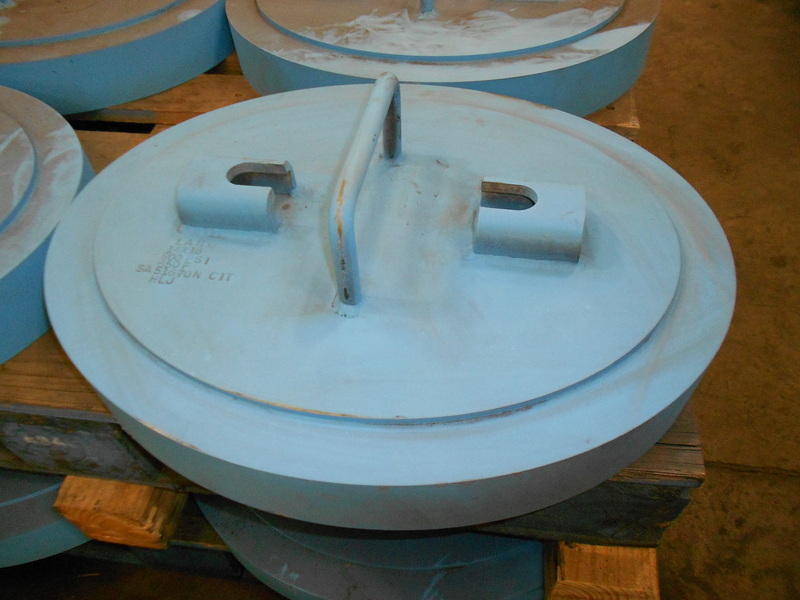 Units in stock are made from carbon steel. Stainless Steel closures are available on special order. They can be supplied with carbon steel or stainless steel externals. Please call for prices. 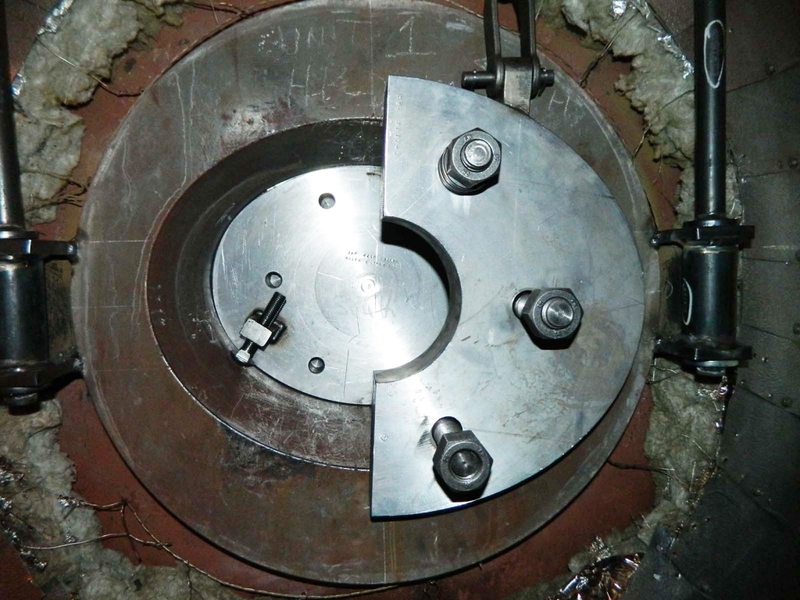 Rasmussen provides hinged closures for 6″ to 24″ pipe diameters. These closures are available for 300 PSI service. 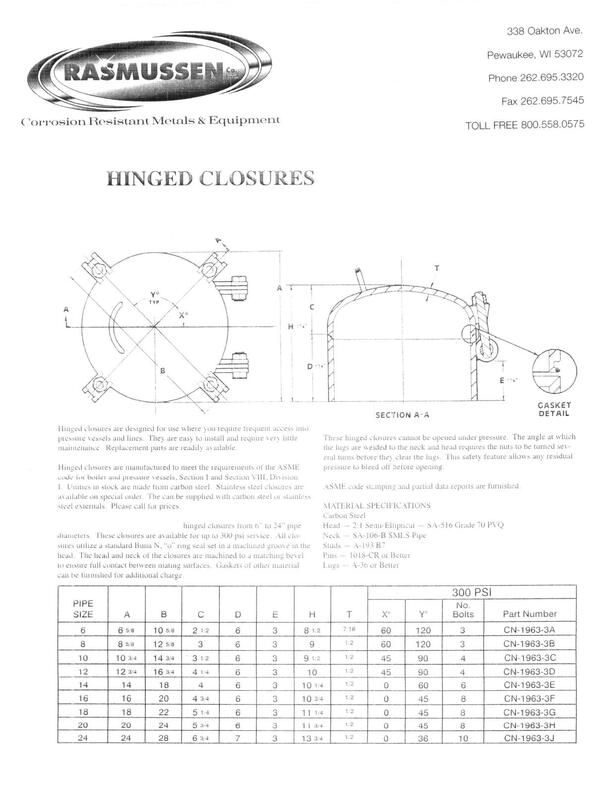 All closures utilize a standard Buna N O-ring seal set in a machined groove in the head. The head and neck of the closures are machined to a matching bevel to ensure full contact between mating surfaces. 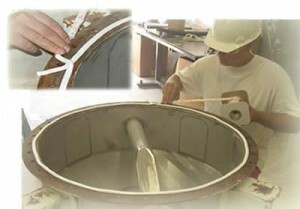 Gaskets of other material can be furnished for an additional charge. These hinged closures cannot be opened under pressure. 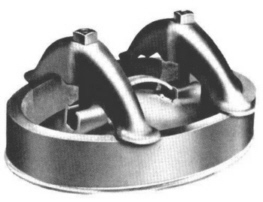 The angel at which the lugs are welded to the neck and head requires the nuts to be turned several turns before they clear the lugs. This safety feature allows any residual pressure to bleed off before opening. ASME code stamping and partial data reports can be furnished if requested at the time of ordering. 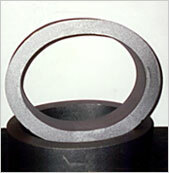 The Rasmussen Company offer gaskets in a wide variety of materials for use with round or elliptical manways. PTFE adhesive backed gaskets are strong and tough, yet soft, allowing them to conform to any surface. They compress to a thin, wide ribbon under pressure. PTFE gaskets do not deteriorate with age, are unaffected by many chemicals, tolerate temperatures up to 650° F and pressures of 3000psi, and will not contaminate flow products. In addition, PTFE’s non-stick characteristics allow easy manway opening. Peel away adhesive backing makes installation simple. This is a well known plastic material that can be used in environments up to 250° F.
This is a synthetic rubber gasket material useful for certain process applications. It can tolerate temperatures up to 200° F.
This is a flexible metal gasket material for use in high pressure, high temperature situations.